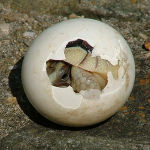 A tortoise hatchling emerges from its shell. Tortoises can live in many parts of the world, but the most common Tortoise, the Desert Tortoise, lives in hot climates in bush scrub habitats. The Desert Tortoise is able to obtain 140 degree weather because of it's ability to burrow underground. They spend 98% of their time underground. Desert Tortoises spend November to February in a dormant state (having normal physical functions slowed down for a period of time) for hibernation (a state of inactivity during winter months). The Desert Tortoise's most active time is in the spring when they search for food. During the hot season they store water inside their body, much like a camel. 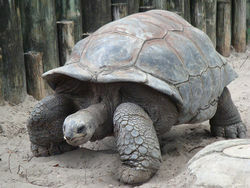 The Desert Tortoise is only one example, but all of family Testudinidae have a similar lifestyle. ↑ Testudinidae Wikispecies. Web. last modified on 12 November 2015. ↑ 3.0 3.1 3.2 3.3 3.4 Wikipedia, users. Tortoise wikipedia. Accessed January 26, 2016. This page was last modified on 3 March 2016, at 17:54.